I purchased a chicken cantina bowl and a steak cantina burrito. Both were priced below $5, and the location I visited was running a buy-one-get-one-free promotion for the cantina items. Both the bowl and burrito were comparable in size to what one could purchase at Qdoba Mexican Grill or Chipotle Mexican Grill. The cilantro rice was flavorful, and I found the steak to be delicious. The chicken in the bowl lacked a little in flavor, but it came with a citrus and herb marinade that mixed well with the corn, chicken, guacamole and lettuce in the bowl. For $2 more, I added chips and salsa and a medium beverage to my meal. Nancy Luna, a food reporter for The Orange County Register, even gave Taco Bell’s cantina burrito the nod over Chipotle’s. I wouldn’t go as far as Luna in saying that Taco Bell’s burritos are better than Chipotle’s, but what I had at Taco Bell on Thursday certainly was an upgrade from Taco Bell’s familiar tacos, burritos and other items. 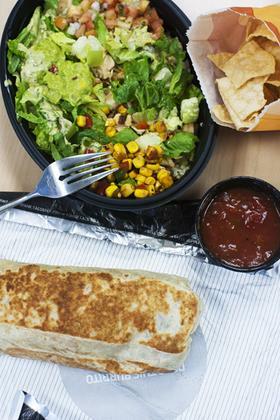 The Cantina Bell menu has been in the works since October 2010, and Taco Bell, a subsidiary of Louisville-based Yum Brands Inc. (NYSE: YUM), has worked with chef Lorena Garcia to develop the menu, which also features guacamole and a number of salsas. It will be interesting to see how the menu does in the Louisville market. Qdoba already has a strong hold on the market, with 13 locations, according to the company’s Web site, and Chipotle is expected to open a location downtown. This entry was posted on Thursday, October 25th, 2012 at 9:38 pm and is filed under Burrito, Flavor, Food, Franchise Activity, Growth, Hispanic, Ingredient, Menu Development/Innovation, Menu Trends, Price. You can follow any responses to this entry through the RSS 2.0 feed. You can leave a response, or trackback from your own site.